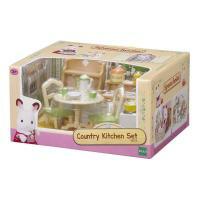 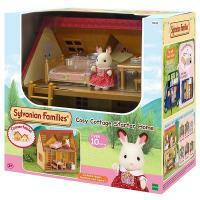 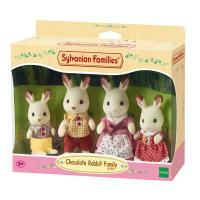 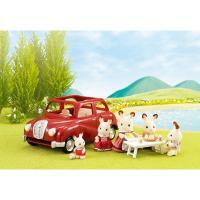 The Cosy Cottage is the perfect choice those starting out with Sylvanian Families. With its red roof and beige brick style exterior, this quaint two floor cottage includes a ladder to connect the upstairs and downstairs. 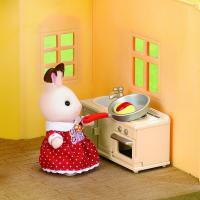 As well as coming complete with Freya Chocolate Rabbit Girl and a selection of starter furniture, the set also comes with smaller accessories such as frying plan, fork, dish and omelette. 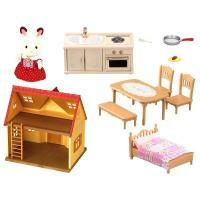 The kitchen furniture includes a kitchen table, bench, two chairs, a coffee table plus a kitchen unit containing an oven and sink, and bedroom furniture such as a bed, mattress and some pretty floral bedding. 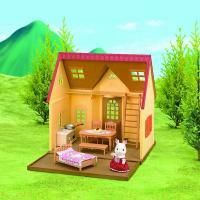 The panel that divides the two floors is detachable, and doubles as an additional garden area. 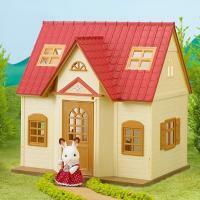 This house is connectable and can be used to extend Beechwood Hall (sold separately). 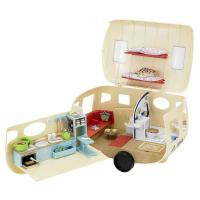 You can also use the kitchen furniture to transform the Bluebell Seven Seater (sold separately) into a Campervan!